TORONTO — Andrea Azteni proved Saturday he's a cool customer in traffic. Sitting last with a quarter-mile remaining the Italian jockey masterfully manoeuvred Desert Encounter to the lead, overtaking 3/1 favourite Thundering Blue in deep stretch for the stunning win in the Grade 1 $800,000 Pattison Canadian International. Fran Berry did a nice job taking Thundering Blue to first down the stretch after standing sixth with a quarter-mile remaining but couldn't prevent Desert Encounter from earning his first Grade 1 victory Saturday afternoon. 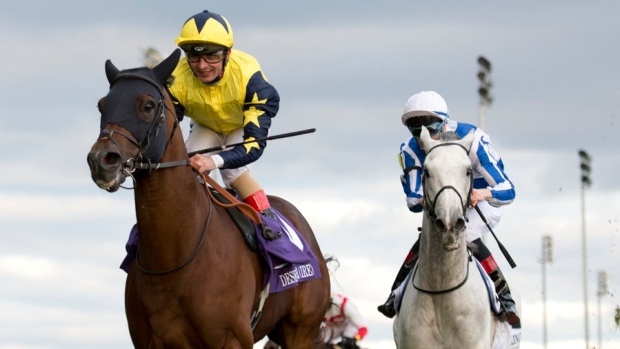 "He travelled good into the race and I followed the favourite all the way through, Thundering Blue," Atzeni said after winning his first Canadian International in four tries. "I thought he was the one to beat and he's a horse that's got such a high cruising speed and then when he saw me, he actually got a very good turn of foot as well. "You can't get to the front too soon because once he gets to the front, he thinks he's had enough. But he's a horse that has a lot of ability and it's great for the team at home, great for (winning trainer David Simcock) and the owner and everybody involved." Desert Encounter's kick surprised Philip Robinson, the racing manager for winning owner Abdulla Al Mansoori. "I thought the horse was going to go run second when he pulled out (because) the other English horse (Thundering Blue) quickened up well," said Robinson. "I thought, 'Well he's going to win the race, we're going to run second,' but then he found another gear the last 200 (metres) and it was all over. "He got a great ride. He saved ground all the way around and pulled out when he needed to." Irish-bred Desert Encounter, an 8/1 longshot based in England, won the 1 1/2-mile race by a length in 2:28.88 on a good turf at Woodbine Racetrack. Thundering Blue finished second in the 11-horse field ahead of Focus Group, the 4/1 second choice. "I knew I had a good bit of horse and I was prepared to stay in and ride the rail until we got into the stretch," Berry said. "When I picked it up we got a perfect split right at the right time. The remainder of the field, in order of finish, included: Tiz a Slam; Spring Quality; Markitoff; Johnny Bear; Bandua; English Illusion; Khan; and Funtastic. Azteni continued his winning ways in the Grade 1 $500,000 E.P. Taylor Stakes. He guided French-bred Sheikha Reika, a 6/1 pick, from fourth to the lead down the stretch for the 1 3/4-length victory over Golden Legend, another French-bred horse, in the 1-1/4-mile turf event for fillies and mares three years old and up. Desert Encounter, a six-year-old gelding, was third in his last race, the Grade 3 Dubai Duty Free Legacy Cup at Newbury on Sept. 22. He finished just a half-length out of top spot on a soft turf after winning the same race last year. "He hit the front 100 yards from the post and just died right on the line," Robinson said. "And the others just came on and got him. "This was better ground today and he loved it." This marks the seventh time in eight races that a European horse has won the Canadian International. American-based Bullard’s Alley captured last year's race. Desert Encounter earned just his second win in eight starts this year but the eighth in 23 career races. The $480,000 winner's share more than doubled Desert Encounter's career earnings as he came into the race having made just under $389,000. Desert Encounter paid $18.20, $7.90 and $5.40 while Thundering Blue returned $5.40 and $3.50. Focus Group paid $3.60. The International win was the first for trainer David Simcock but it wasn't his first taste of success at Woodbine. In 2014, Simcock won the Grade 1 Northern Dancer (Sheikhzayeroad), Woodbine Mile (Trade Storm) and Grade 2 Nearctic (Caspar Netscher). "I think (Simcock) has had this race in mind for a long time for this horse," Robinson said of Desert Encounter. "He always said this was the race for him and I think he sort of set out his program throughout the whole season with the aim to come here and it's worked out so he's got it dead right. "He tends to get the right kind of horses for the occasion, this track and this distance. I think you'll be seeing a bit more of him."